Thanks for the tips on how to use this tool! I have a question, though — what does it mean if Get Listed doesn’t detect a listing that I know I have and is active? For the one I just checked, my Get Listed report said I wasn’t listed through Localeze, but when I logged into my Localeze account, my listing is there, live, accurate. I also have a listing on which the Yelp gods removed the city name from my business listing, even though the official business name includes it, and locked it, so that doesn’t show up on Get Listed, either. Thanks for the compliments, Jennifer! Regarding how to get GetListed to detect your listing, probably the first thing I’d suggest is entering your name + zip and then hitting the “Advanced Check” link. Sometimes you’ll see several listings to choose from–listings that GetListed views as similar to each other. Maybe one of them will be yours. 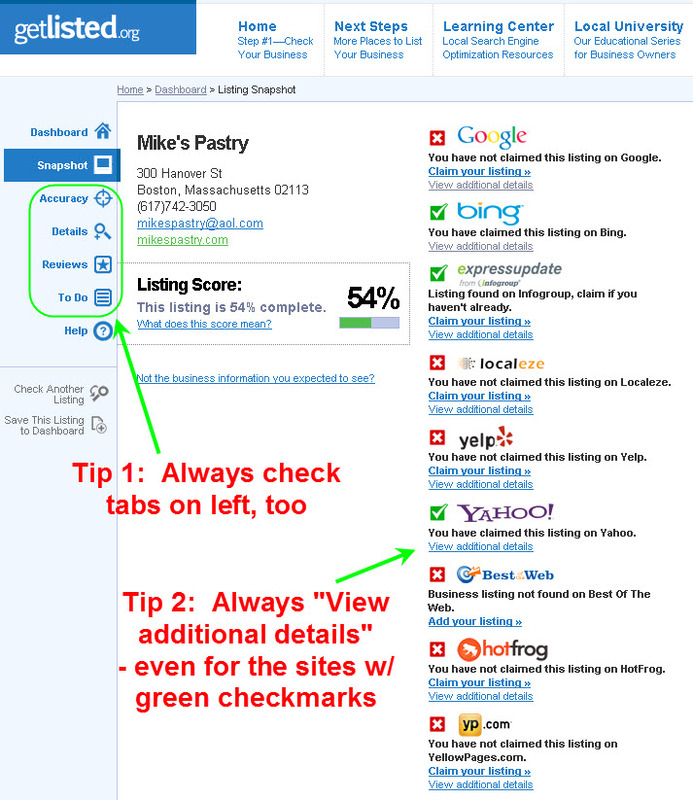 It takes LocalEze (and to a lesser extent Yelp) quite a while to process your listings, and even longer to transmit their data on you to LocalEze, so it will take quite a while for a claimed LocalEze listing to show up with a green checkmark in GetListed’s scan results. Therefore, I suggest you don’t enter your business info as it appears in LocalEze; rather, I suggest you got to your Google Places listing and enter your name + ZIP as they appear on your Places page. See what happens then. If none of these works, feel free to shoot me an email with a shortened URL to your Places page and/or a screenshot of what you’re trying to put into GetListed. 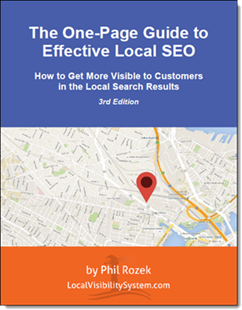 I registered my business in almost 50 local search engines. I have enhanced listings in Yahoo Local, BOTW, Mapquest, Localeze. Google places sees only Kudzu and Service Magic reviews. Nothing else. Some other companies don’t have any citations (shown below reviews) but still they are on the first, second place in Google places. Am I something missing ? All information are consistent – the same phone format, street name, dots, Caps Locks etc. Everywhere I have the same company description. Great question –a big question. It sounds like you have the data-control part pretty well-covered. There’s a ton you could be missing, though. If you’re too much farther then your competitors are from the center of the city you’re trying to get visible in, that might be a factor. Reviews are crucial, especially Google Places reviews and reviews written on InsiderPages, CitySearch, YellowPages, etc. Website factors also matter–like title tags, having your NAP on every page, and (to some extent) links. Between the above and all the info on this site and others’ sites, that should be enough to go on. But I can take a super-quick look if you shoot me a link to your Places page.